On 24 April 2015, GlobeCore representatives visited one of the hydroelectric power stations to inspect the current status of the GlobeCore equipment sold there a few years ago. Turbine oil is used to lubricate the bearings and gearboxes on the main generating equipment as well as the regulation and control units at the hydroelectric power stations. To perform its functions properly, turbine oil should possess the following characteristics: (1) de-aeration properties; (2) low foaming properties; (3) good anti-corrosion properties; (4) high wear resistant properties; and (5) resistance to aging. In accordance with the existing rules and regulations, oil for hydro-turbines should meet the requirements listed in the table below. Oil viscosity depends on the operational temperature, type and design of the turbine. In practice, it ranges from 46 to 460 mm2/s at 40ºС. During operation, turbine oil loses its original properties. The oil is affected by oxidation, mechanical impurities, and water invasion. But, if the turbine oil is monitored and maintained on a regular basis, it can provide a much longer service life which also extends the service life of the turbine equipment. Preventive Maintenance includes a purification and regeneration process that fully restores of turbine oil’s properties. 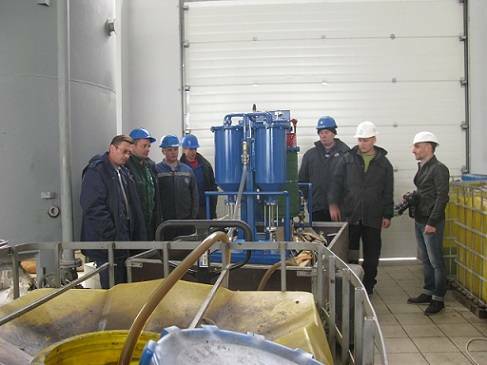 The hydroelectric power station, visited by GlobeCore representatives, is completely equipped with GlobeCore equipment for the purification, filtration and regeneration of the plant’s turbine oils. The inspection showed that all GlobeCore units were working properly after two years of heavy operation. Special attention should be paid to the CMM-4MT unit that is operated on one of the hydro turbines. This unit was designed for complete purification of turbine oils up to the 9th class of purity out of a possible thirteen (13) purity classses. After treatment, the moisture content of turbine oil is no more than 10 g/t and the filter fineness is 5 microns. Depending on the condition of the original turbine oil, the CMM-4T can be operated in the filtration mode or in the mode that combines filtration, drying and degassing. The use of the GlоbeCоre technology significantly extends the service life of turbine oils used in hydro and thermal power stations. There is no need to buy new oil, thereby reducing the operating costs of the power station.